Newgate prison was located roughly where the main entrance to the Galleries Car Park is now. 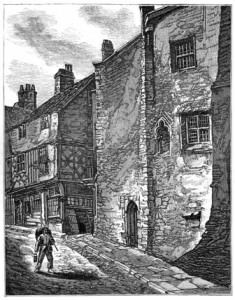 It was converted or rebuilt in 1690 from part of the medieval New Gate which controlled access to Bristol Castle. It was Bristol’s main prison in the 18th century, where most of those convicted of homosexual acts before 1820 were imprisoned. Conditions were appalling, filth and disease rife and prisoners were allowed only a small portion of bread daily; they relied on friends, family or charitable donations to provide extra food and many died through disease or malnourishment. John Wesley and others campaigned for improved conditions. The gaol was replaced by a new purpose-built prison on Cumberland Road which opened in August 1820. Newgate was demolished shortly after.